Russia’s involvement in Syria has muddled the country’s soft power in the Middle East. Moscow has turned into a feared and respected inheritor of the Soviet might; but, the Zogby Research Services survey highlighted that the majority within the predominantly Sunni countries perceive the Kremlin’s support for Assad as a major factor responsible for the Syrian conflict’s escalation and Sunnis’ deaths. The latter alarms the Kremlin, as it wants to avoid entering the augmenting Sunni-Shi’a clash and alienating 90% of the Middle East’s population. Moscow has chosen impartiality as a major strategic tenet within its Middle East policy. Russia wants the Arabs to perceive it as being above the Sunni-Shi’a collision, while being friendly, seeking justice for the Palestinians and, unlike the United States and NATO, not planning to intervene or change anything forcefully. However, the Syrian intervention has seriously damaged Russia’s impartial image, and now Moscow wants it back. The first step in reclaiming the impartial image in the eyes of the Arab majority is for Russia is to utilize the old Soviet card of supporting the Palestinian struggle for self-determination. However, the Kremlin is not interested in getting itself involved in the dissension between Arabs and Jews, as it might affect Russia’s soft power across the Arab world and impinge relations with Israel. Moscow currently enjoys warm relations with both Israel and Palestine, and wants to retain this mutual support for a broad range of regional issues. Therefore, emphasizing intentions is far more beneficial than proceeding with actions. Support for the Palestinians dates to the Soviet era. The Communist ideology of supporting anti-colonial and national liberation movements worldwide was at the top of the Soviet foreign policy agenda during the Cold War. Therefore, Moscow heavily backed the Palestinian issue on the international arena, as well as supplied material support and educated a number of Palestinians in the Soviet Union. Although times have changed, Russia still supports Palestine; according to TASS, between 2006 and 2015 Russia’s monetary support of the Palestinian Authority totaled $ 45 million. However, the current backing is largely non-interventionist and symbolic in comparison to the Soviet scale. Russia’s support is praised by many nations of the Arab world, as it remains the sole global power eagerly advocating the conflict’s solution predominantly on the Palestinian terms. This is exactly what Moscow wants. The Kremlin, likewise, skillfully incorporates this approval into a soft-power strategy to reach out to the hearts and minds of the Arab world. Thus, Vladimir Putin has stressed “the lawful right of the Palestinian people to an independent, viable and territorially integral state with its capital in Eastern Jerusalem” in his communications with the Arab League. Despite Moscow’s pledge to support Palestine internationally, the Kremlin also understands that the Middle East is facing a period of turbulence and Israel seems like an oasis of stability. Therefore, warm and working relations with Israel are vital for Moscow’s long-term geopolitical interests. While it is also important to demonstrate support for the Palestinians, the backing should not cross the Israeli red line. Thus, Russia wants to eat its cake and have it too, and so far, it’s been working. Even though Israel and the Soviet Union were once at the edge of slipping into a war with each other, the situation has transformed dramatically after the end of the Cold War. Currently Israel has more than 1.5 million Russian speaking citizens and Vladimir Putin, arguably, is the most pro-Israeli president that Russia, Russian Empire, or the Soviet Union have ever had: he has officially visited Israel, opened the Jewish Museum of Tolerance in Moscow, and offered Russian refuge to Jews facing anti-Semitism in Europe. 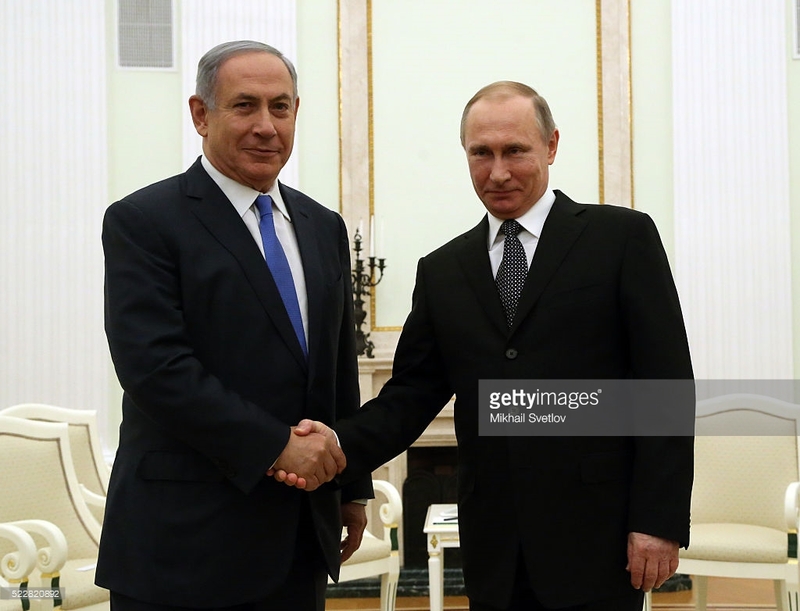 Israeli leaders appreciate Putin’s special treatment. Netanyahu has visited Moscow two times in the past six months while attempting to promote a better Israeli-Russian cooperation over Syria. Furthermore, he was quite content regarding the latest visit outcome and announced that he was invited back to Moscow in June for the 25th anniversary of diplomatic relations between the two countries. Interestingly, Netanyahu has recently sparked an outrage in Washington by canceling an invitation to visit the White House in March. Moscow and Jerusalem are friendly adversaries, sharing similar visions of the general picture in the Middle East and its future, while defending their respective interests. Israel perfectly understands Moscow’s soft power motives behind the support of the Palestinians but prefers to shut its eyes and treat the support as an essential attribute of a power seeking to expand its influence in the Middle East. In effect, Israel realizes it will never receive Moscow’s open support, but is confident regarding its sympathy.